With the remnants of the ill-fated Keeling expedition trapped in a vast cavern stalked by fire-breathing dragons, Brad Conner set out with a desperate hope to bring help to his beleaguered companions. After three months, however, Kathy, Brad’s sister, still had no word from her brother in Burma. So distraught by Brad’s mysterious disappearance into a veil of darkness, Kathy joins forces with Tom Chambers, a long time friend of Ann Cobey’s, to travel to Burma to discover the fate of Brad and the Keeling expedition. Tom and Kathy must contact the clandestine members of the opposition forces to the oppressive military regime of the Union of Myanmar. Only with the help of these courageous freedom fighters secreted in the Burmese jungle can they hope to discover the secret of Brad’s disappearance. Love, courage, and faith are tested to the utmost as they face incredible dangers from both man and nature. 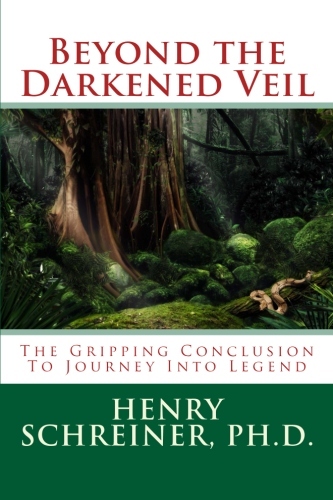 Action, adventure and suspense come to life once again in this thrilling sequel to Henry Schreiner’s novel Journey into Legend. In this fast action adventure novel we discover the truth behind Brad’s disappearance, and realize the awesome responsibility of those who know of the living terror lurking within the earth.